It’s the episode we’ve all been waiting for: a chance to see what makes Maria Hill Fury’s second in command. In fact, this entire episode was filled with powerful women kicking and striking back in the face of treacherous odds. In addition to Skye and Hill earning their keep, we also learned the horrible truth behind Project T.A.H.I.T.I. What does this mean for our heroes? Let’s find out. We find Maria Hill – last seen applying to work for Stark Industries – coming out of a court hearing. Time frame wise, this was probably the same court hearing we saw Black Widow coming out of at the end of Captain America 2: The Winter Soldier. In the grand scale, barely 72 hours have passed since the fall of S.H.I.E.L.D. While on the phone with Pepper Potts – Tony Stark’s girlfriend – Hill starts talking about the hearing and how awful Congress was. The most noticeable of their questions was who or what was a ‘Man-Thing’. At first this is a rather obscure reference to another Marvel character, but actually has a connection to Ironman 3. Remember that hot EXTREMIS Soldier in Ironman 3 – ok, that’s redundant – I’m referring to the red head woman that stalked Tony. Well her name is Ellen Brandt. She was originally in love with a S.H.I.E.L.D. scientist named Ted Sallis who was tasked with recreating the Captain America super-soldier serum. She eventually fell out of love with him and started having an affair with an A.I.M. Agent before joining A.I.M. as well. Brant confronted Sallis and tried to steal his research. Not wanting to let it slip into the wrong hands, Sallis gave himself the serum as he was shot and left to die in the Florida Everglades. The serum turned out to be another failed attempt and mutated Sallis into a monstrosity that then attacked Brandt and scared her face, which explains why Brandt was given the EXTREMIS formula in the first place. 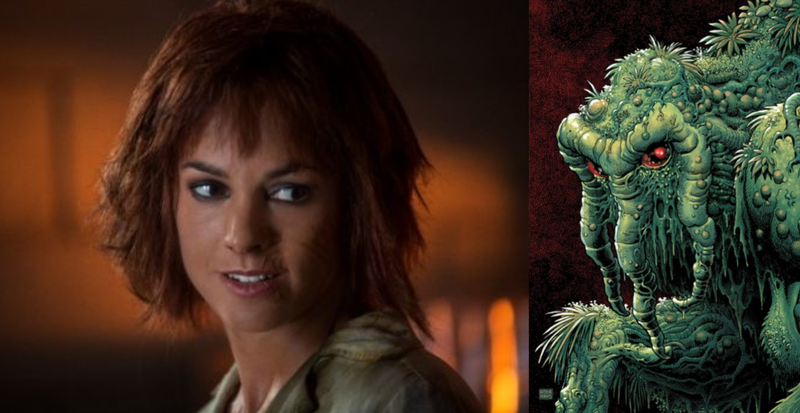 Whether or not we’ll see Man-Thing in Agents of S.H.I.E.L.D. remains to be seen considering Man-Thing’s rights are actually owned by Lions Gate who released a TV movie about Man-Thing in 2005. Since its not a big money maker for them, I’m sure Lions Gate would return the rights to Marvel Studios if asked nicely. With Providence Base deserted and their plane – known as The Bus – stolen, Coulson and the crew try to piece together what happened in their absence. With all the security cameras and outgoing/incoming video feeds cut, the team has no way of seeing Koenig’s murder or the damning satellite evidence that Skye uncovered from The Fridge Breakout. All that remains is the motion sensor of the Bus cargo hold, which shows May packing up and leaving as well as Skye and Ward getting on the plane hand in hand. Coulson and Agent Triplet run through the scenarios in their heads and determine that either Koening isn’t telling them something or they’ve been betrayed. But while Coulson and Triplet are thinking of the possibilities, Fitz and Simmons discover the grisly truth on their own. While getting pancakes, Simmons discovers Koenig’s body in the storeroom while Fitz discovers Skye’s message to the others: ‘Ward Is Hydra”. After an autopsy of Koenig’s body, Simmons confirms that Ward is the only one who could have killed him, which sends Fitz into a major freak-out. Coulson luckily is able to calm Fitz down and have him work towards restoring communications to the base. Sadly, the team’s troubles are just beginning. Just as Coulson and the team find out where the Bus is – as well as what Ward wants with Skye – Providence is overrun with US Special Forces. Despite all the base’s defenses, they walk through the front door unharmed as Maria Hill – who hopes to strike a deal and get Coulson to join her at Stark Industries – has already turned over the base to them. Unlike Coulson, the other agents will have to go through interrogations and prove their worth in the system. 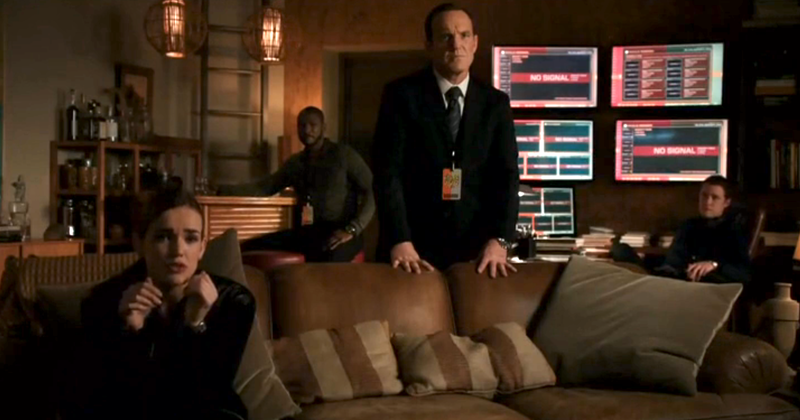 Coulson immediately turns down any talk of abandoning his team and tells Hill about Ward’s true allegiance. Realizing that time is of the essence and that the special forces has no interest in pursuing another agent, Hill decides they have to take matters back in their own hands. What follows is the moment we’ve been waiting for since the Avengers: Maria Hill being awesome. Hill and Coulson team up and take down multiple Special Forces agents in quite possibly the best fight scene on this show yet. With the team back together, Coulson and Hill leave Providence with the other agents and head to LA to find Skye, who hopefully has bought them enough time. When we saw Skye at the end of last episode, we knew she had a plan – but what? Turns out while she was in the bathroom, she scrolled up one of the pictures and wrote ‘WARD IS HYDRA!’ on it. Then she reset it back to the night photo and jammed a stick in there so that it wouldn’t change photos until someone realized it was stuck. Now while on the road with Ward – I mean air – she basically kept making up the plan as she went. First she tried to get some weapon on her, but Ward proved to be quite the clingy boyfriend and refused to leave her side for a second. There was only one way she could buy herself some time: use big words. Skye takes advantage of the ever-staring Ward and takes his photo. Then creates an emergency dispatch making him a known ‘wanted criminal’. Even in the end, when she is forced to give up the decryption code for the Hard Drive, she tells Coulson how she left them a ‘present’. Skye was amazing this episode and demonstrated everything she has learned this season: maintaining a believable cover story, coming up with an escape plan, staying calm under pressure, etc. Skye’s plan seems to work and gets her away from Ward, but sadly Deathlock is waiting a few blocks away to intercept Skye. Back on the Bus Ward tries to no avail to get Skye to talk, even saying his feelings for her were real – which makes Skye sick to her stomach. It became very clear this episode – as in the past few – that the only chance Ward has of redemption is in his death. He is far too gone and has hurt too many. No one knows what’s a lie and what’s real sentiment anymore. All that’s clear is his dedication to Garrett. He might turn against them in the end, but his place on the team is long gone. Which is sad for him since he’s finding that his place on Garrett’s team might not be as secure as he though either. In order to get Skye to talk, Deathlock stopped Ward’s heart. Even though Skye has zero care for Ward anymore, she isn’t a killer. This is exactly what Garrett was counting on, and Skye obviously talks. She wants Ward to suffer, but not die. She’s not as heartless as he is. With Skye revealing the Hard Drive decryption is altitude based, her usefulness has been used up and Garrett will most likely kill her regardless of what Ward says. Thankfully, Skye’s bought Coulson and the others enough time to enact their own plan. Just as Ward and Deathlock are about to take off with Skye still being held captive, Hill and Triplet intercept the plane’s take off. Ward knows Hill won’t shoot down their plane as long as Skye is one board, but this whole situation is just a distraction while Coulson sneaks on board the Bus to rescue Skye. Despite being a distraction, this scene does give some insight into why some S.H.I.E.L.D. agents betrayed Fury – Hill. Some lost respect for Fury when he chose Maria as his second in command. They saw it as him just picking some eye candy to look at and never once considered Hill’s many talents. I’d explain how wrong they were, but we’ve already seen ample evidence of Hill’s awesomeness this episode. If anyone could be Fury’s second in command, it’s Maria Hill. 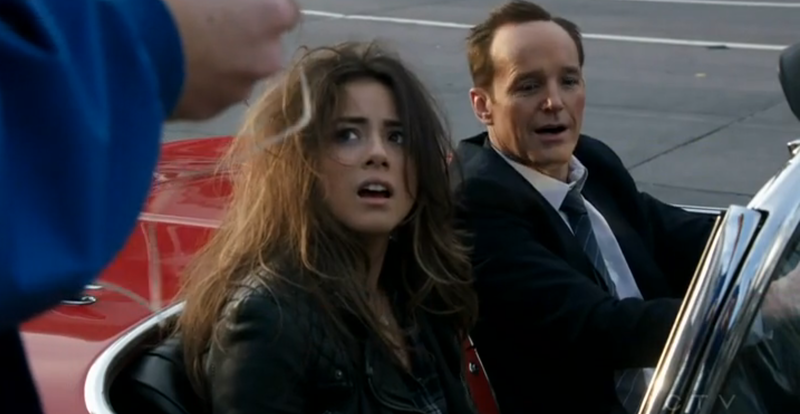 Back on the Bus, Coulson rescues Skye and then heads to take down Ward. Skye then informs Coulson of Deathlock’s presence on the Bus just as he appears in front of Skye and Coulson. With no other option but to run, Skye and Coulson head to the cargo bay and drive off the ship in Lola who has been outfitted in antigravity repulsers. Despite a bumpy landing, everyone is safe and left to think out their next move while Ward gives Deathlock a VERY empty threat. With no more back up coming and no desire to ‘get the band back together’, it seems like Coulson and them are on their own. Hill tries once again to recruit Coulson to come and work for Stark – who would obviously take him in a heartbeat – but Coulson again refuses and says the private sector isn’t for him. Meanwhile, the others are outside the hotel they are currently staying at relaxing and waiting for their next orders. While Fitz is still not making a move on Simmons, I am thoroughly enjoying Agent Triplet more and more. He’s calm, cool, sarcastic – especially his remark about junk food is his vacation. 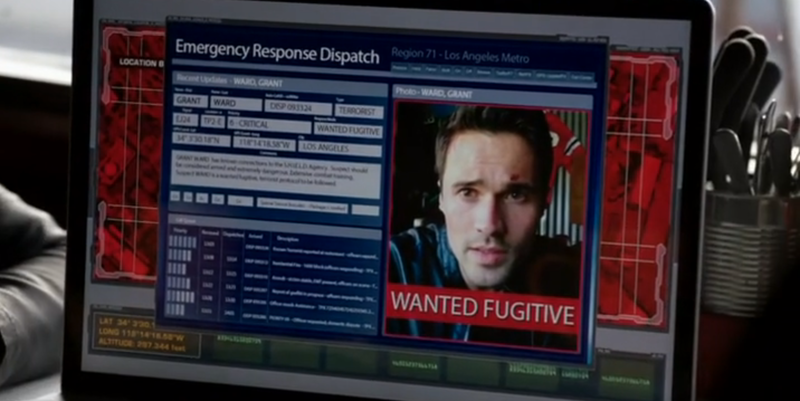 He is everything we wanted Ward to be and more. A final thing to note is what Skye meant by leaving a ‘present’ for Deathlock and the other Hydra agents on that Drive. Is it a bomb? A locator? Or maybe something to disable HYDRAs control over Deathlock? Say what you will about ‘Ward having his reasons to follow Garrett’, but Mike Peterson deserves a happy ending after everything he was forced to do as Deathlock. In the end, he is less responsible for his actions than Ward. What Ward does, he does out of allegiance to Garrett. What Peterson does, he does to protect his son. 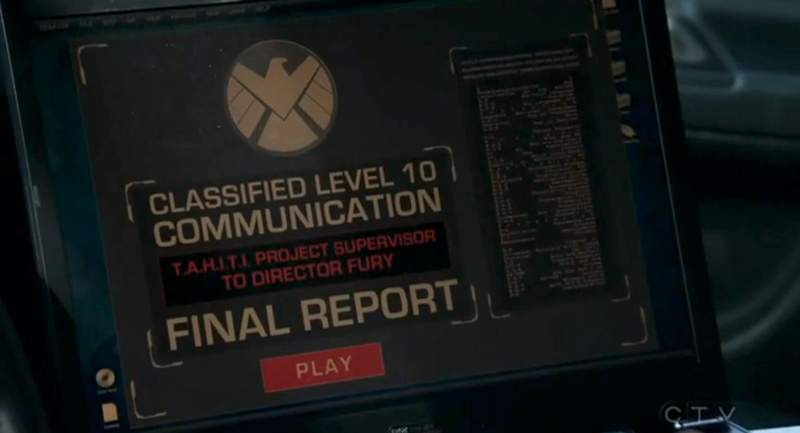 As with all Marvel Studios productions, the big reveal always comes after the credits; and Agents of S.H.I.E.L.D. is no different. After the final commercial break, we got the earth shattering revelation about T.A.H.I.T.I. and who was behind it. 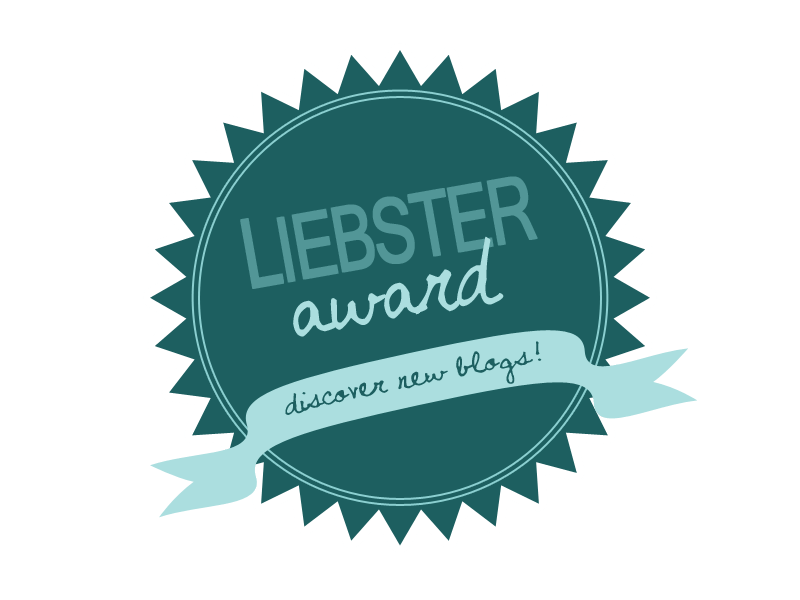 Are you sitting – because you really should be. It turns out the mystery man in charge of the T.A.H.I.T.I. Project was Coulson himself. Buried in Coulson’s own grave, Melinda May discovered the horrifying truth about the T.A.H.I.T.I. Project and why Fury told May Coulson had to be watched. A truth so awful that Coulson told Fury of these developments while intending to hand in his resignation as well. Originally design to “save a mortally wounded Avenger”, the project proves to be too inhuman and the side effect ‘too extreme’. Originally, we though this meant that the procedure hurt or Coulson was happy ‘on the other side’. Whereas this may also be true, the real reason he was pleading was because he was fully aware of what was being done to him. That the very procedure he had just begged Fury to stop was now being used on him. As for the episode title, there actually several things this title alludes to. The first of which is in Captain America 2: The Winter Soldier and frames every occurrence in this episode. When Steve Rogers is attacked in the elevator by a bunch of Hydra agents lead by Brock Rumlow, Rumlow says “Nothing personal” to which Capt responds that it certainly feels personal. This idea of someone saying ‘nothing personal’ and then someone calling *BS is continued throughout this episode. The first of which is when Ward tells Skye his betrayal of the team was nothing personal and Skye immediately calls him out for saying something so outlandish because betraying teammates and friends is everything that someone can read as personal. The second occurrence is when Deathlock stops Wards heart. Ward threatens him to which Deathlock says in a belittling manner ‘nothing personal’. Although for Deathlock, part of it is personal. Garrett might have given the orders, but I’m willing to bet Deathlock enjoyed that order quite a bit. As I aid earlier, he might be following Hydras orders like ward, but Mike Peterson is doing to protect his son. Here, Deathlock has a change to not only hurt a Hydra Agent but also to hurt the man who shot him in the start of the season. Skye also pointed out that Peterson didn’t shoot her a while back because there’s still good inside him. Skye is the one person Mike can be sure cares about him and his family. So seeing how Ward played her and the rest of Coulson’s team – who are good people – I also bet there was part of him that was okay with getting some payback for them. Of all the people this season, Deathlock deserves his freedom and redemption. Again, hopefully Skye’s little ‘present’ was a way to take Deathlock off Hydra’s leash. We saw how Deathlock was trying to decrypt the Hard Drive with his own brain, so maybe there lies a way Skye could hack his systems and take control – or rather give control back to Peterson so he can be the hero he wanted to be. And here is one more shot of Maria Hill kicking but – because it was awesome. What will become of Coulson and Skye after these shocking revelations? Will Skye’s status as an 0-8-4 save her – as well as Coulson? Further more, what will happen to the team in general? I personally hope Coulson does sign up with Stark in the future. Him and Hill worked great together and I would love to see more of Cobie Smulders. She not only kicks but, but it seems like some of Tony Stark’s snark is rubbing off on her. Ooooh, I didn’t actually catch how this new revelation about T.A.H.I.T.I. put a new spin on Coulson’s “let me die” line. Wow, thanks for pointing that out.